Every now and then, a watch that doesn’t cost very much really catches my eye and proves to be an unbelievable bargain. 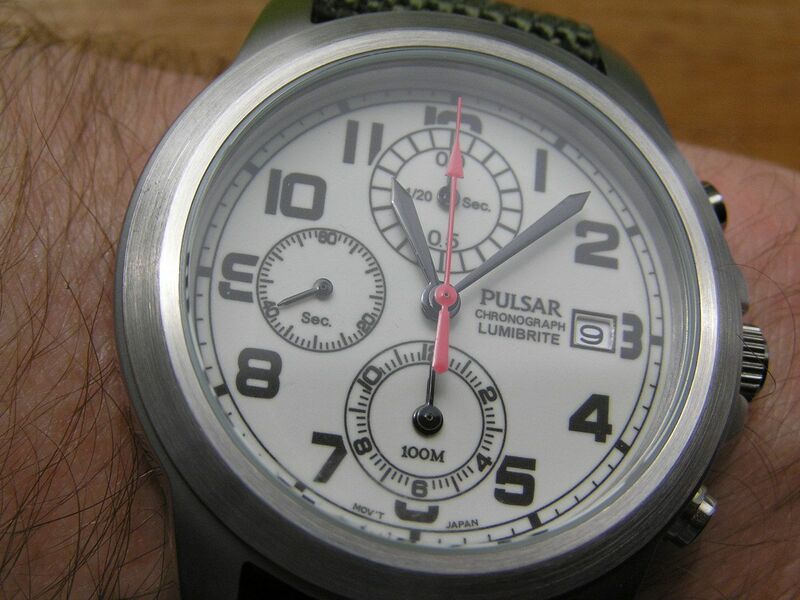 Case in point, this nifty Pulsar lume dial chronograph. Have you ever cruised a site like Amazon looking for the cheapest price you can find on a particular item? I do so every now and then with watches and lo and behold, this Pulsar popped up for the almost criminally low price of $38 USD delivered. Are you kidding me? That price was too low to resist, so your humble servant had to buy one to check it out. Turns out to be potentially my best buy of the year, value-wise. This Pulsar sports an all stainless steel case which is polished, with a brushed bezel and a polished screw down stainless steel case back. 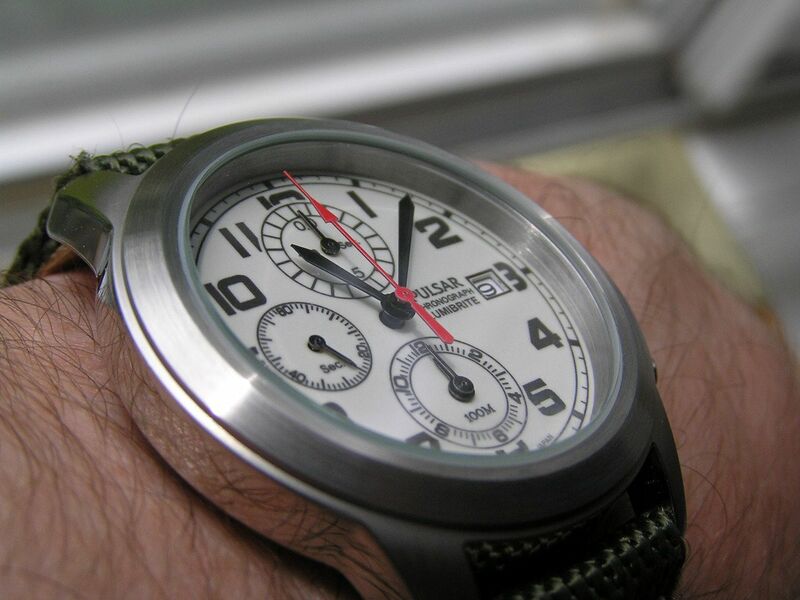 While it is admittedly a bit small at 40.3mm without the crown (42.8mm with crown), this watch still impresses. 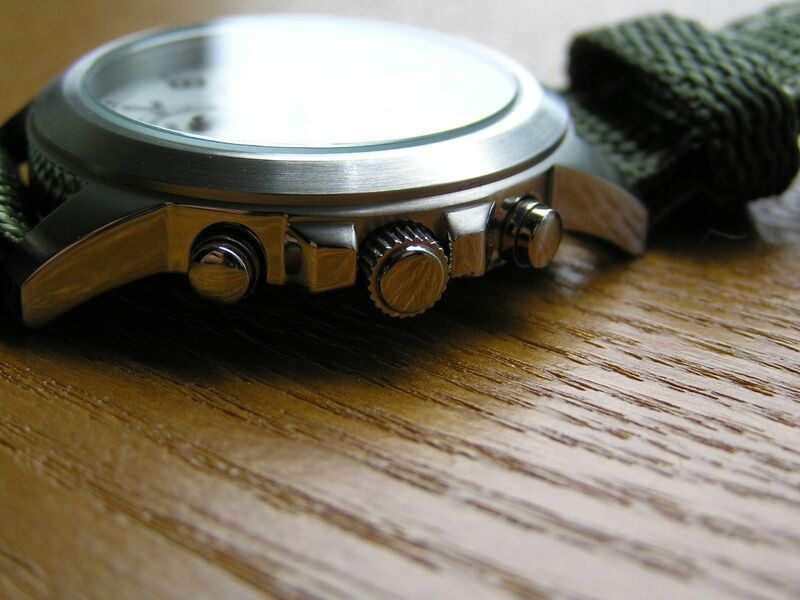 It tends to wear small due to the width of the bezel. 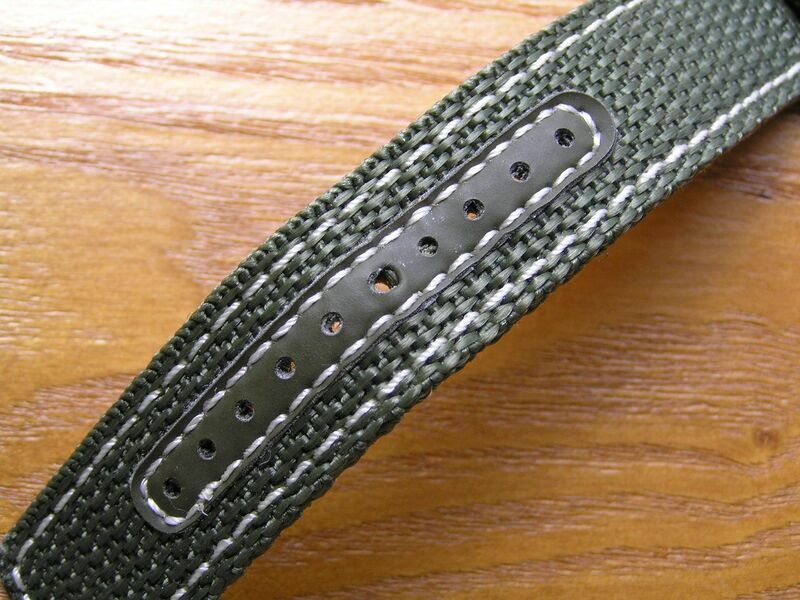 Lugs are 20mm, offering plenty of options for different straps. Thickness is a comfy 10.4mm. The crown does not screw down and is unsigned. The chrono pushers are standard round buttons and have a good feel to them. The watch is rated at 100 meters water resistance. The dial and movement are where this little guy gets interesting. 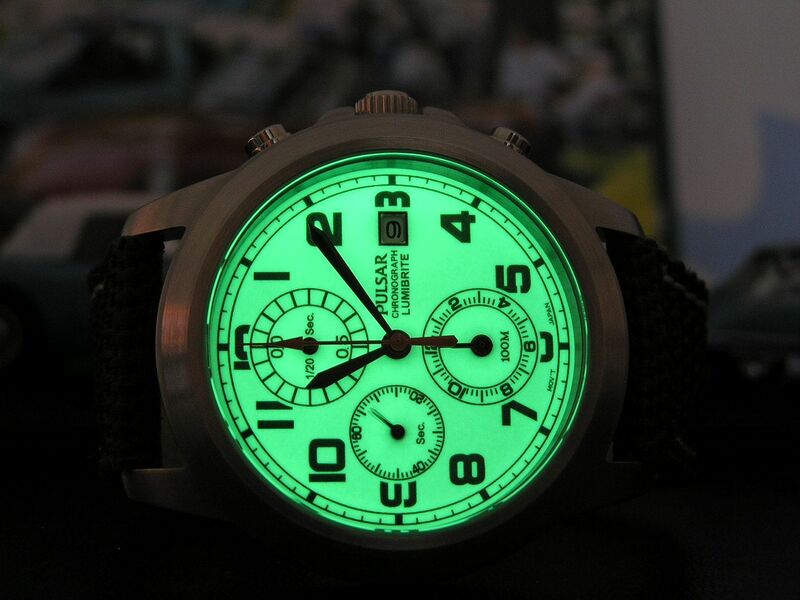 The dial is not only full lume, but is Seiko’s Lumibrite material, so it glows well and glows brightly for a long time with minimal exposure to light (especially sunlight). 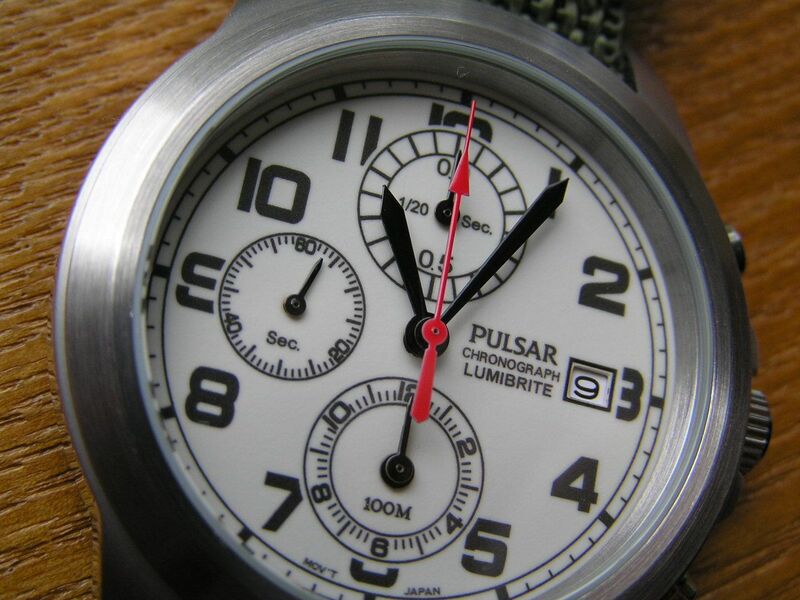 A lume dial chronograph is hard to come by and for those who want one, this Pulsar definitely fills the bill. The hour and minute hand are solid black, so they are easy to see and read against the lume dial. The subdial hands are black, with the chrono second hand being red. Arabics are printed in solid black as well. There’s nothing superfluous about the dial, it’s all business. The printing on the dial could be a bit crisper, but it’s not a major distraction. A quickset date window resides at the three o’clock position. 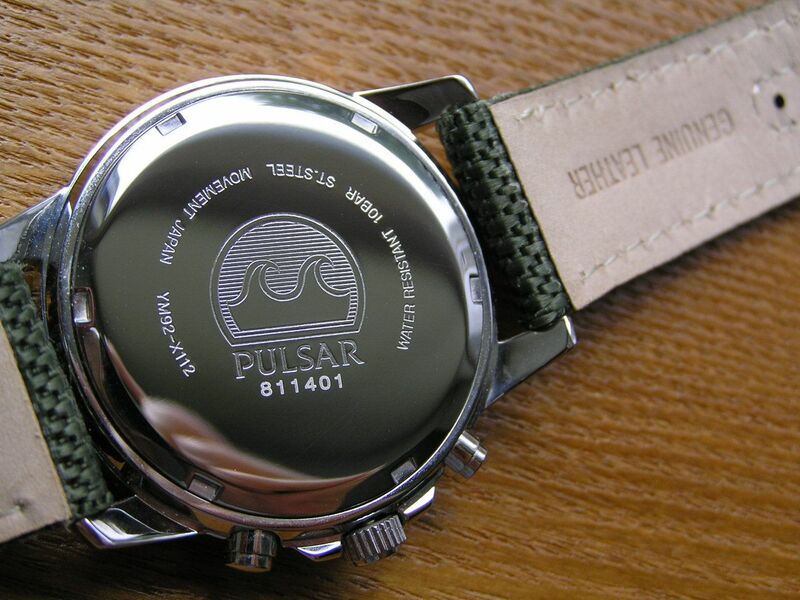 The dial is capped by a flat Hardlex mineral crystal, the same material used on many other Pulsars and Seikos. As previously mentioned, one thing that delivers strong value with this piece is its movement. The Japanese quartz chronograph is Seiko’s tried, true and beloved YM92/7T92 caliber, which offers 1/20th second timing up to 12 hours. What makes this movement cool is two things. First is the way the top subdial (the 1/20th second indicator) spins super fast as it counts off the time in 1/20th increments. This will continue up to about 10 minutes, when it stops and sits idle until the chrono is stopped, then it will move to display the appropriate 1/20th of a second time. This is done to conserve battery power. The second neat part about this movement is the lower subidal @ 6. This subdial has two hands, the longer of which displays the minutes for the chronograph, while the shorter hand is the hour indicator. Upon chrono reset, these hands will spin themselves clockwise to reset themselves to the 12 position. While it does take a bit of practice to learn how to quickly read the minute indication, since it’s not incremented as minutes on the subdial, this layout does work well and gives this watch 12-hour chrono capability. The subdial at 9 is the continuously running seconds hand for the watch, while the red second hand is for the chronograph. Since acquisition, this watch has kept absolutely superb time, running just two seconds slow over about two months, which is outstanding by any measure and especially when the low purchase price is factored in. When I originally ordered this watch, I was planning on changing out the strap because I’m not overly fond of nylon straps. 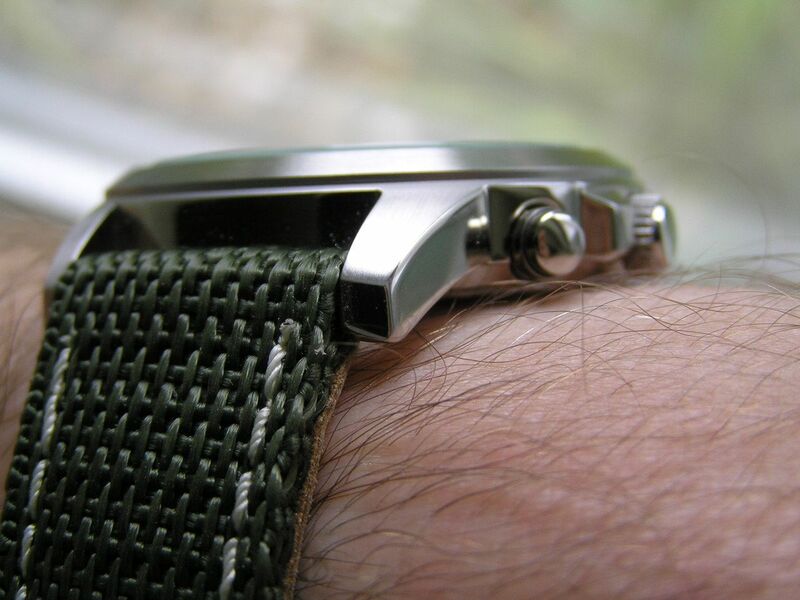 When the watch arrived, I was pleasantly surprised with the quality and look of the nylon strap. 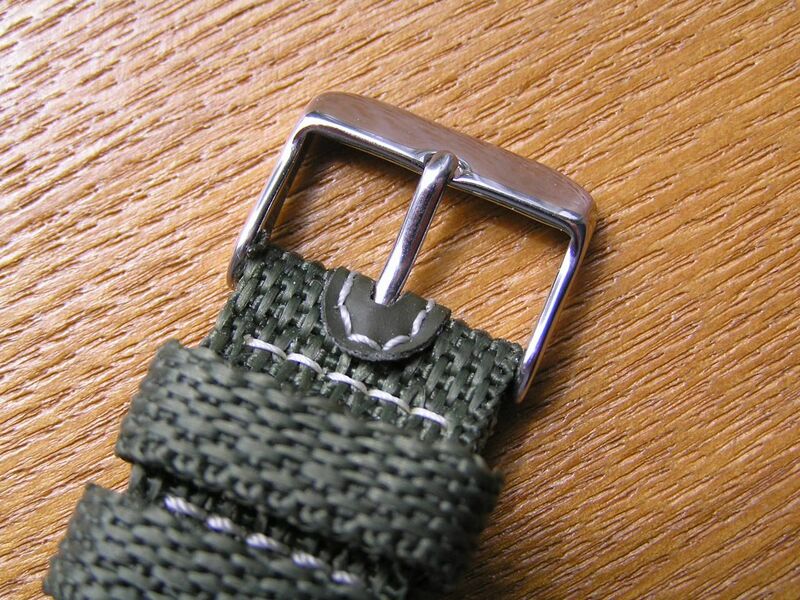 Running a continuous length of 20mm from lug to buckle, the strap is lined with leather, rather thick olive drab-ish nylon with white contrast stitching. 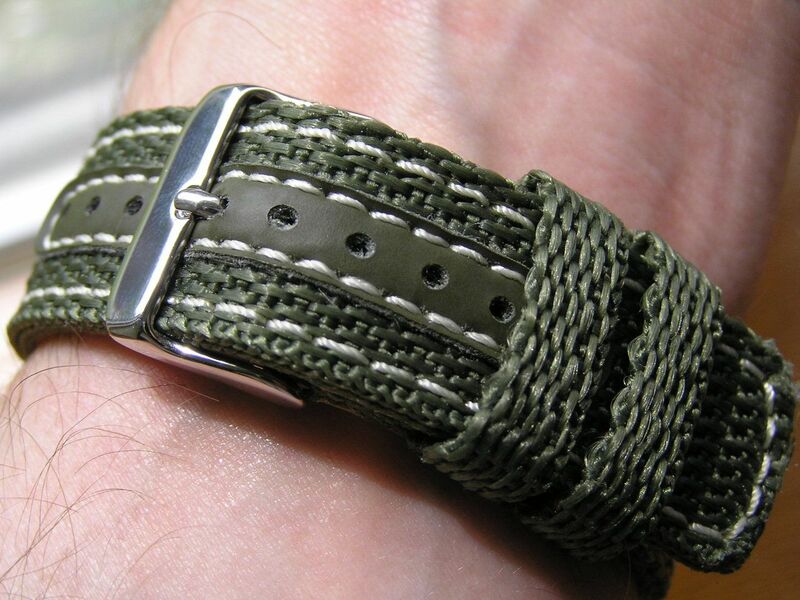 the color of the strap adds to the military/field watch nature of its design. 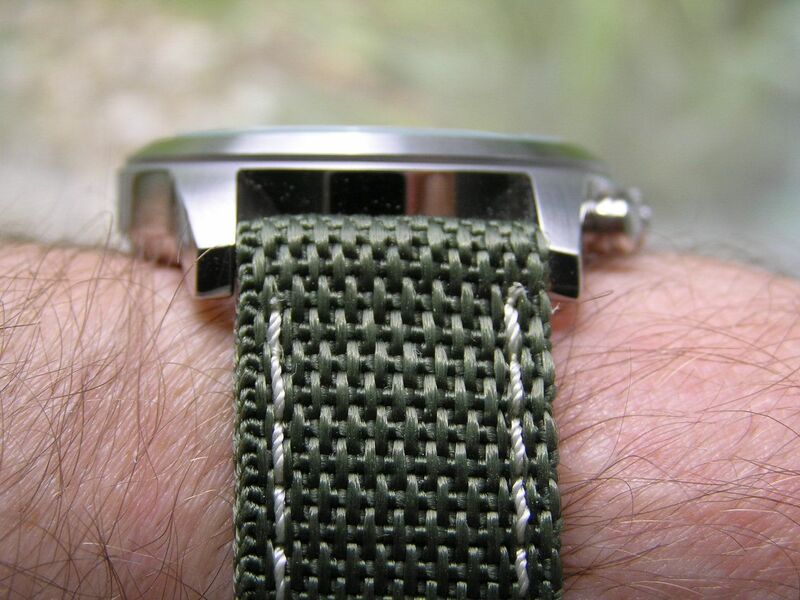 As of now, I am wearing this watch with the stock strap, although it is a tad uncomfortable at times as the nylon can be a bit rough against the skin around the edges. 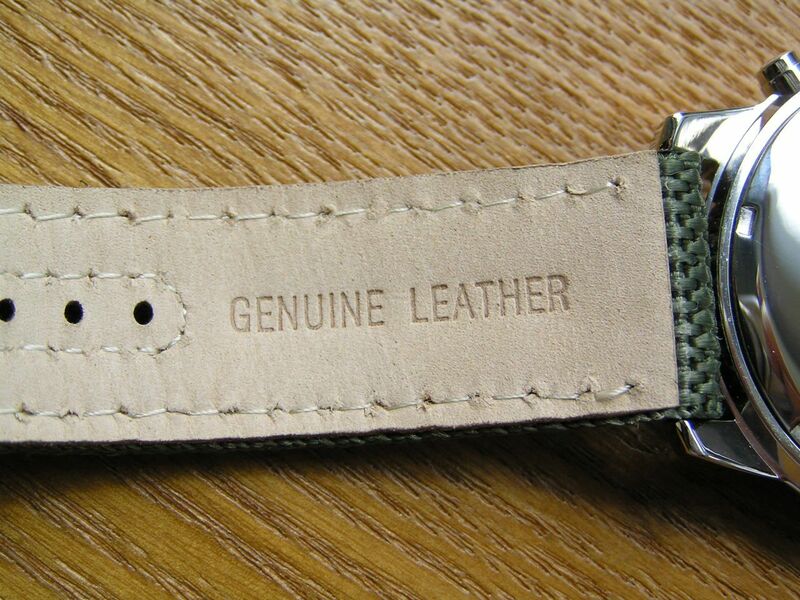 The strap has two wide keepers (one fixed, one floating) along with a polished stainless steel buckle. 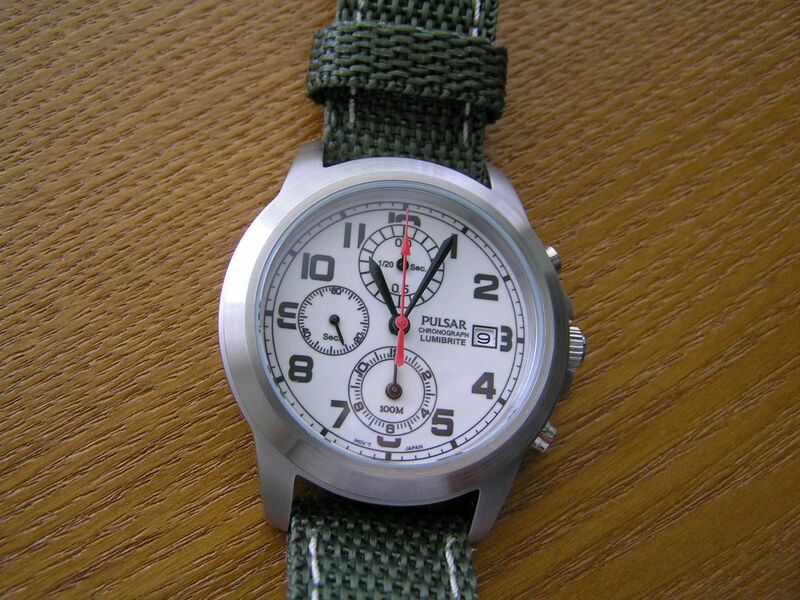 Many times, various Pulsar models will have the same movement as more expensive Seiko models and this Pulsar is a perfect example of this. 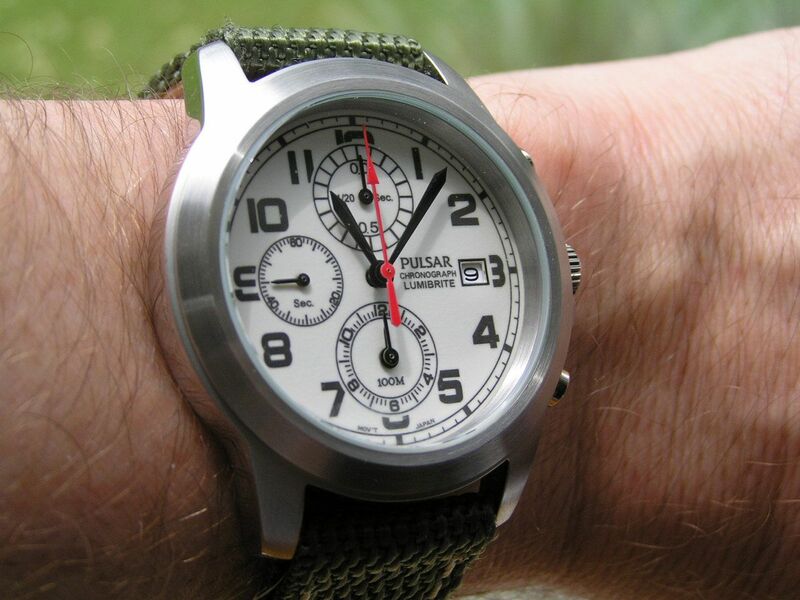 I have the same movement in a Seiko (also reviewed on this blog) that cost almost four times as much as the Pulsar. 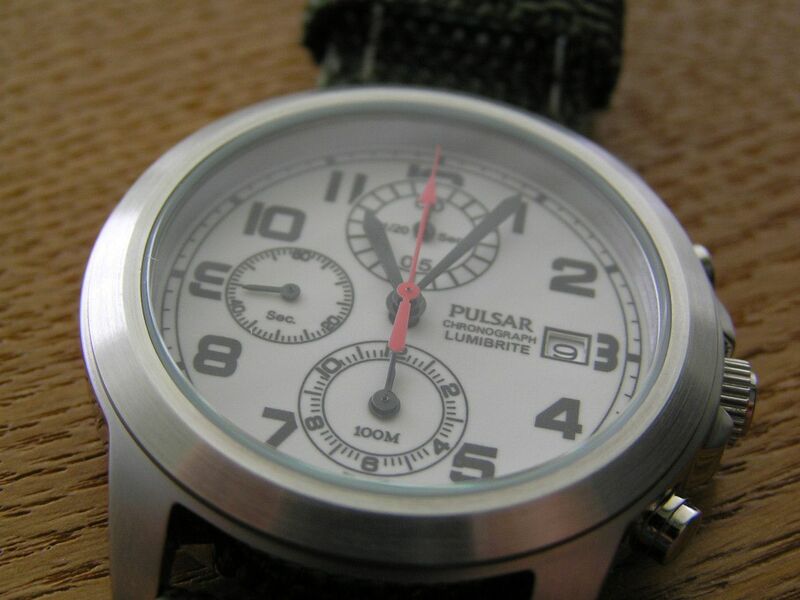 A Pulsar equipped as such can be an inexpensive way to try out a movement you may be interested in without making a large investment. It doesn't always work this way, but sometimes, it does. Presentation was nothing special, but for $38, who’s complaining? Not me! 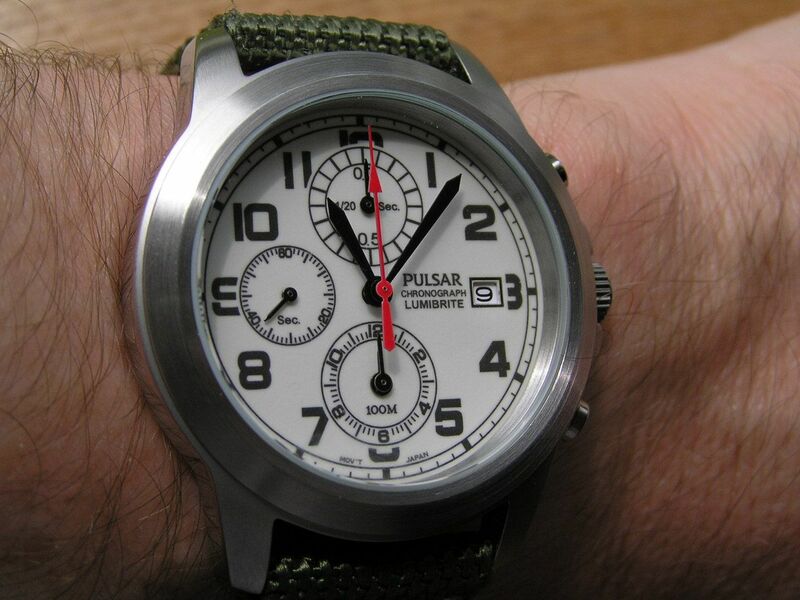 Overall, this Pulsar chronograph is a strong little piece with some unique features that you don’t find everyday. A gem of a watch, especially for the price. Your review made me drool for this watch when I saw one come available on eBay recently. Just got it today and really, really like it, but mine seems to have a faulty 1/20th sec dial. The chrono starts, but that movement doesn't work. I have the SDNA65 so I know what it is supposed to do, but for now, I'll live with it.